This edition features a durable and almost invincible Yupo Synthetic Paper. LIMITED edition 3-pack 48-page Memo Books. Proudly Printed and Manufactured in the U.S.A.
Each book measures 3-1/2" wide by 5-1/2" tall and is bound with a rugged three-staple saddle-stitch process. Durable Materials featuring Yupo Synthetic Paper, Pocket Size. Our new "Expedition Edition" features a hi-visibility "Antarctic Survey Orange” front cover and "Polar Night Black" back cover, with a subtle varnish effect featuring a topographic map of Antarctica. The body pages feature our popular 'dot grid' graph paper, printed in light gray. FNC-17 marks the start of our fifth year of FIELD NOTES COLORS. In that time, we’ve explored a wide variety of papers, colors, and printing techniques, but with this new "EXPEDITION" edition, for the first time, we’ve actually expanded the basic utility of our notebooks. Please click on this link to view each test. The majority of our customers may not test the limits of these books, but the map of Antarctica is neither hyperbole nor coincidence. We’ll be sending the "EXPEDITION” edition to the South Pole with explorer Ben Saunders as he and his team retrace Captain Robert Falcon Scott’s ill-fated journey to the Pole and back, on foot and unsupported, starting in October 2013. Note: Synthetic paper is nonporous and doesn’t absorb ink like our conventional papers. Our new "Expedition" FIELD NOTES are pretty close to invincible, at least by notebook standards, but waterproof paper is nonporous and doesn’t soak up ink like most paper. That’s good in some ways (no bleeding, feathering, or show-through), but it does limit the writing implements you can use. 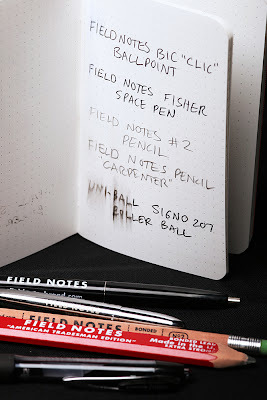 Regular ball-point pens and pencils work fine, but pens that lay down a lot of ink, like fountain pens, rollerballs, and markers, don’t dry as quickly, and may smudge and/or come off on the opposite page (image provided). Your "Expedition” 3-Pack is wrapped in a bellyband made of the same Yupo paper that’s in the books, so (after trying to tear it!) you can test your pens there and see what works best.